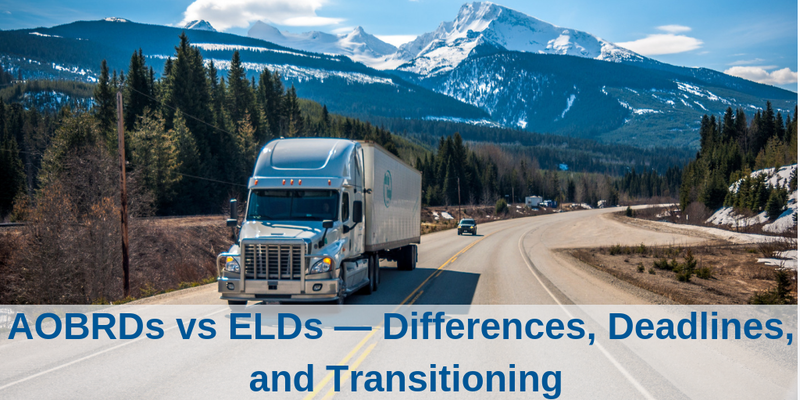 Many companies already transitioned to AOBRDs before the ELD mandate, and with good reason. While these automatically recording devices are relatively simple compared to ELDs, they empower companies to ditch expensive, disorganized paperwork and centralize drivers’ Hours of Service recording processes. Collect far more data. Among other items, ELDs track date and time, truck location, engine hours, vehicle miles, driver information, vehicle information, and carrier data. Provide a more exact duty record. ELDs record truck locations at each duty cycle change, plus once an hour if the vehicle is moving. ELDs can produce graph grids of driver duty status changes. Prevent unpaid hours. ELDs notify drivers if they forget to sign into devices before driving. Facilitate seamless record sharing. Drivers can easily share truck data via wireless web services and email, or USB2.0 and Bluetooth. In both cases, information is also sent to the FMCSA’s eRODS software. Resist tampering. While drivers and supervisors can edit driving logs, drivers must approve all changes, and edits must include explanations. For trucking companies that already installed AOBRDs, ELDs can be considered an upgrade. ELDs aren’t just fancy technology; they can have a real impact on trucking businesses and drivers. One of the main reasons the ELD mandate was created was to improve driver safety. Previously, it was possible to manipulate paper logbooks, allowing drivers to work longer than appropriate and consequently endanger people on the roads. Already, hours of service (HOS) compliance has increased drastically, with HOS violations decreasing from December 2017 to May 2018 by nearly 50%. Even more improvements to driver safety may be seen with potential upcoming changes to proposed HOS rules. Businesses, as well as drivers, are seeing benefits. Before, operations centers may have struggled to keep track of paper logs of items like driver schedules and load data. With ELDs, electronically transmitted information is automatically centralized and easily organized. Additionally, detailed, accurate data collected by ELDs offers businesses the chance to track patterns and recognize trends, empowering leadership to make better-informed business decisions. While there were some issues with low quality ELDs in the first stage of ELD mandate implementation, high-quality ELD devices offer promising advantages to both drivers and trucking businesses. The transition to ELDs can seem like a large undertaking. Not only does your business have to physically install the devices in applicable trucks and carriers (and uninstall AOBRDs if your trucks have them), but your business must also train drivers and decide how to work with the new records that ELDs produce. Luckily, there are clear steps to take that will streamline the transition for both drivers and back office staff. As soon as your administrators decide which brand’s ELD you wish to use, you should start the transitioning process. This way, your business will be comfortably compliant once the deadline of December 16, 2019 arrives. Prepare for deployment. In this initial phase, introduce the idea of the ELDs to drivers and staff, reviewing their many benefits so team members are not resistant to the upcoming change. Pilot the technology. Install all applicable vehicles with the ELDs and teach drivers how to log in. In the office, decide how to centralize past driver’s logs, and instruct office staff about new recording techniques. Thoroughly train drivers. Drivers should learn how to fix basic device malfunctions, how to send data to law enforcement officers, and details of ELD capabilities. Train administrators and office staff. Staff should learn how to review and suggest edits to logs. In turn, administrators should learn how to review and analyze logs, spotting patterns and making inferences based on those trends. At the end of the transitioning phase, your fleet will be ELD mandate-compliant and excited to hit the road with their new, updated devices. Interested in becoming ELD-compliant with the highest quality fleet management technology available? Contact us today.